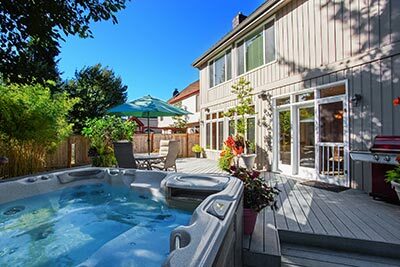 Upgrade your backyard with Clearwater Spas. These feature-packed spas emphasize cleanliness and intuitive operational controls, making it easier than ever to relax at home in a spa of your very own. Outdoor Living LLC is proud to offer Clearwater Spas and all the advantages these high-quality products have in store. No one wants to take a dip in murky water, but life is too hectic to dedicate part of your busy day to draining and scrubbing out a dirty spa. Luckily, Clearwater Spas use a Dual Defense Purification System™ that continuously cleans water using UVC light and ozone. Rather than relying on harsh chemicals, the DDFS system uses a natural disinfectant process to help destroy bacteria, yeasts, algae, viruses and other potentially toxic contaminants, reducing unpleasant odors and protecting the life of your equipment. You save time and money and enjoy crystal-clear water too. Enjoy next-level spa cleaning with Clearwater Spas’ Total Purity System. TPS includes our exclusive dual-filtration system combined with a proprietary mix of four cutting-edge approaches to water treatment. Copper/Silver Ionization System: Natural minerals like silver were first used by NASA to purify water use in space missions, and copper irons are proven to help control algae growth. Clear Balance Conditioner System™: Discover the power of 2000-gauss magnetic strength. This system operates continuously and automatically, delivering positively charged water molecules that smell pristine and feel great on your skin. Germicidal UV: UV sterilization uses ultraviolet light to kill microorganisms such as viruses, bacteria, algae, mold and protozoa, reducing the need for chlorine. Ozone Generator: The EPA has approved ozone as an antimicrobial oxidizer, disinfectant and sanitizer. Here, it improves your spa’s water quality by filtering out organic and inorganic contaminants. Throw a party and show off your clear water and sparkling spa system to friends and family. Clearwater Spas come with a removable bistro table perfect for holding a frosty beverage or some tasty snacks, and the multicolored LED table leg only adds to the visual appeal. It’s just another way Outdoor Living LLC is helping clients like you build better backyards and enjoy life to the fullest. The second-best thing to experiencing a Clearwater Spa at home is to see one in person in our showroom. Get directions to our Chambersburg, PA, location and come explore our full range of exciting products.